So I know that most people go to carnivals for the rides and games but I go for the food! And sometimes to waste money trying to get a prize. So for rides I did not ride any but I played he basketball game and lost, so sad! 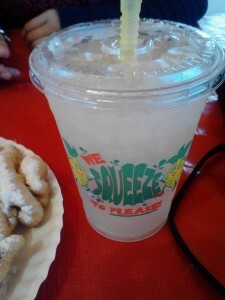 But I was so excited to get my funnel cake and homemade lemonade so that made up for it! Below are pictures of the funnel cake and lemonade. 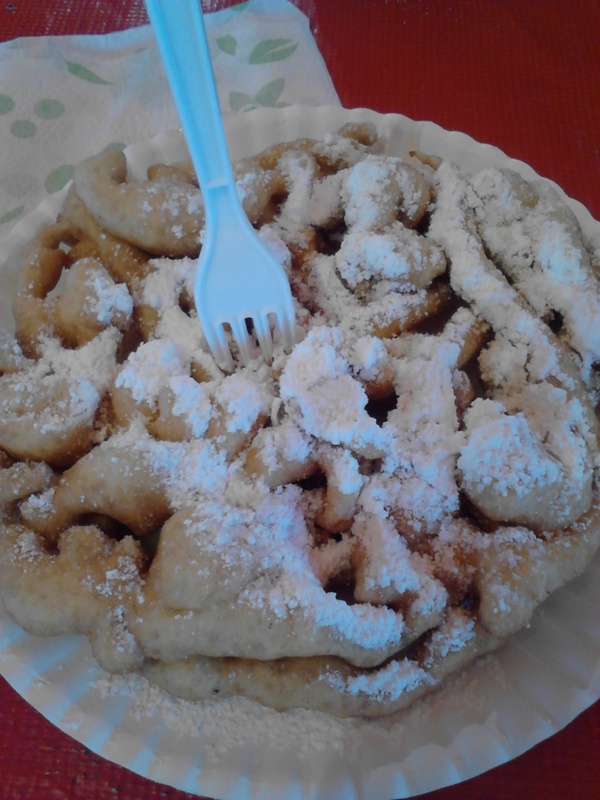 The funnel cake was amazing! I watched them but the batter in the frier and it came out nice and warm. Of course it was on a paper plate and covered in powdered sugar. From what I saw all of the funnel cakes looked very similar. As for the lemonade it was to die for! That holy cow amazing! Now I’m not 100% sold on the idea that it was home made but whatever there was half a lemon inside. 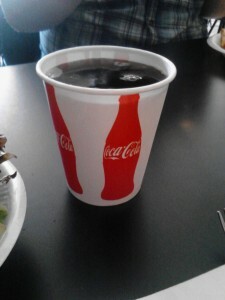 It came in a cute plastic cup with a lid and straw that were cute as well. As most fair food it was over priced. But seeing as the fair travels around and there are a million lights and sounds the price is probably reasonable. Oh and it’s always fun watching other people’s children get hopped up on sugar!!! This entry was posted in Uncategorized on June 13, 2013 by Daltynn. I have been to Minervas a few other times for receptions but never for lunch or to order from the menu. This was also the first time I drove there and that scared me a little bit because I have never drove on that side of town. But it was a lot easier than I thought it was going to be, there was some minor construction going on that caused some distress but I made it on time so that is all that matters. When we sat down at our table the waitress and other staff were very pleasant when our group number changed and we needed more room. This time when the waitress come around to get our drink order I decided not to go with ice tea but instead I ordered a Mojito. It was delicious! 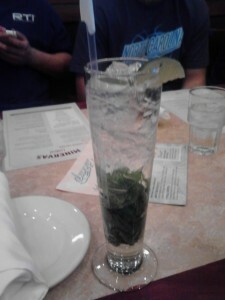 There was a lot of mint and the lime was not too much. It came in a pretty neat glass also (see picture below). On the lunch menu there is no appetizer list so if you want one you have to ask for a dinner menu. I did not order any but I did try the onion rings from another persons, they were really good. They were crunchy but they did not have too much breading on them and the onions were completely done. 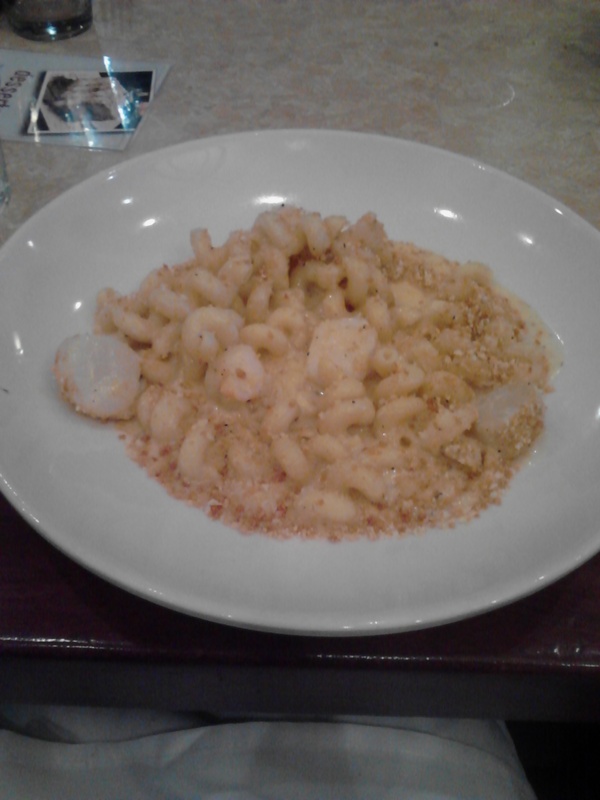 For lunch I ordered the Seafood Mac & Cheese ($10.50) and the Italian House Salad ($2). The salad came first and was what I expected. The lettuce tasted fresh and crisp. The vegetables on it also seemed fresh. The cheese was sliced into thin pieces. The presentation could have been better. For instance they could have placed the toppings in different areas, that way if someone did not like that certain one it would be easier for him or her to take it off, instead of all of the toppings being put on top of each other. Next the main course came out and I was surprised that my salad had seemed to be a larger portion than my seafood mac & cheese did. 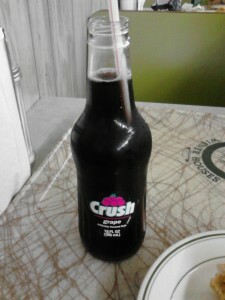 As for taste it was awesome! The white cheddar cheese sauce was great on the schrimp and scallops (I did not get salmon on mine). Usually I would add salt and pepper to mac & cheese but this time I did not have to. The presentation was nicely done: everything in the inner circle and a nice clean rim. I loved how the scrimps were shaped like the Cavatappi noodles. The seafood was placed in a mannor that you could see it and not be shocked or surprised when taking a bit, in other words it was big enough so you could see it. 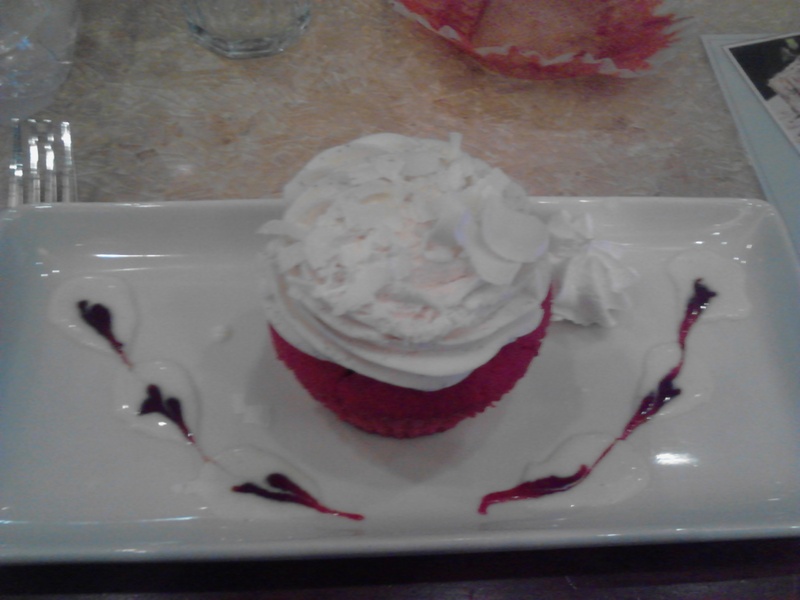 For dessert I got the Red Velvet Cupcake and oh my gosh it was huge! I did not expect a cupcake to be that big. The red velvet cake was good but the cream cheese frosting was the best part! 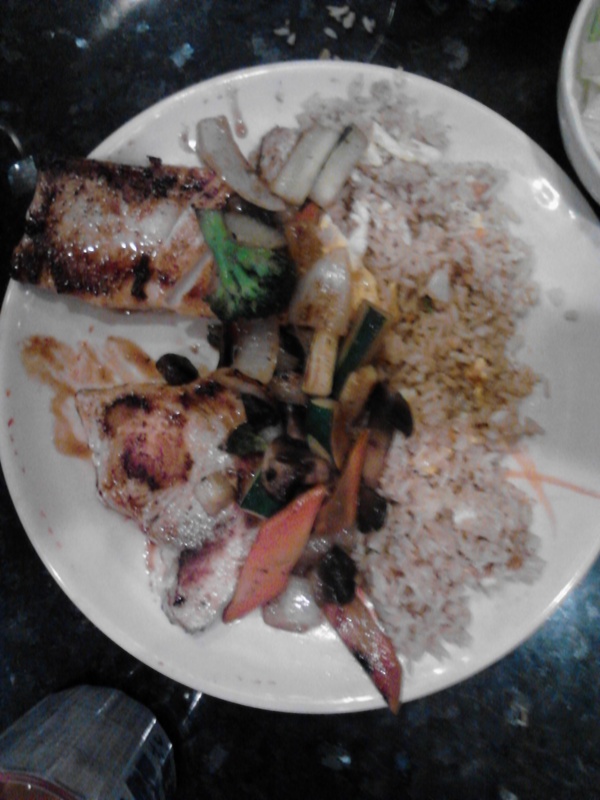 Oh it was good. When I finally made it to the center of the cupcake there was a cream cheese filling also, it too was awesome. The plate was stunning, as you can see from the picture below. The cream and strawberry sauce around the front was done beautifully and tasted just as good. Overall I love going to Minervas. The food is great, the staff are wonderful, and the atmosphere is inviting. This is a classier place so if you are planning a date here I would say to wear something that falls into the category of business casual. This entry was posted in Uncategorized on June 2, 2013 by Daltynn. 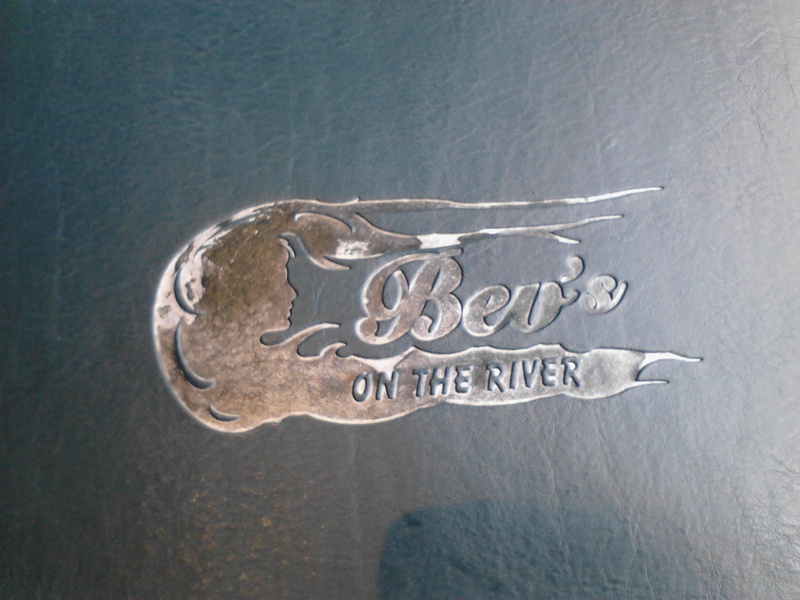 Going to Bev’s was very exciting, I had always heard wonderful things about it and figured those people would not lie to me. While driving down there my GPS told me to turn a little too soon but other than that Bev’s was easy to find once in the area. When I got there I had no idea that we would be that close to the river. It was beautiful, the view and the restaurant. While waiting for our table some of us sat at the bar and I decided to look through the cocktail menu. I loved how many of the drinks were named after movies. 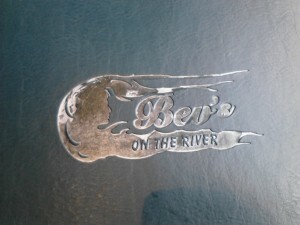 Once we were seated our table was next to the windows and looked right out over the river. 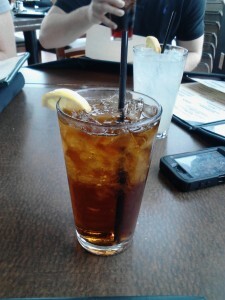 Our waitress came around and took our drink orders. 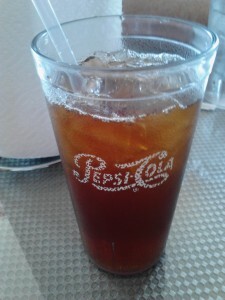 Of course I got an ice tea and it was pretty generic. The menus were gorgeous, they were green in color, thick, and folded into a trifold. On the front the restaurant’s logo on the front, which could be a woman’s face and hair, a schrimp, or both. The waitress returned after some time to get our lunch orders. 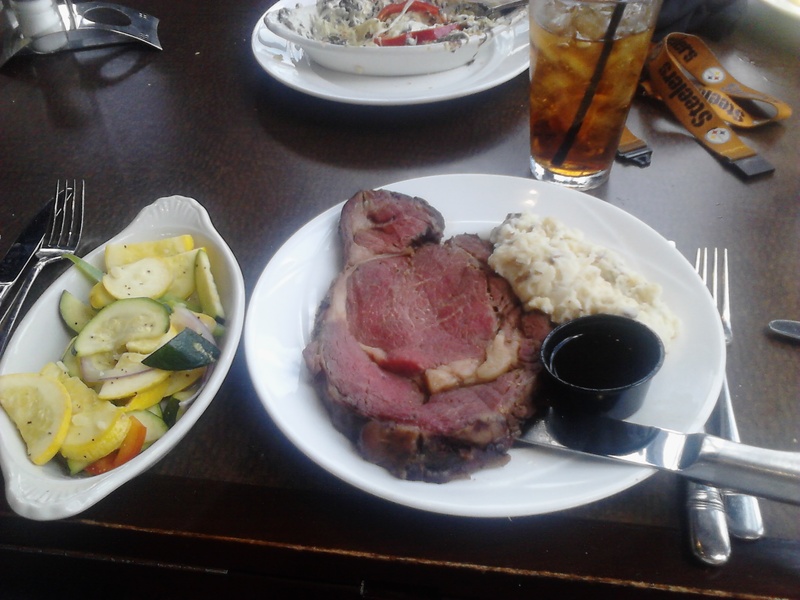 I ordered the Prime Rib with garlic mashed potatoes and sautéed vegetables, it also came with a house salad. 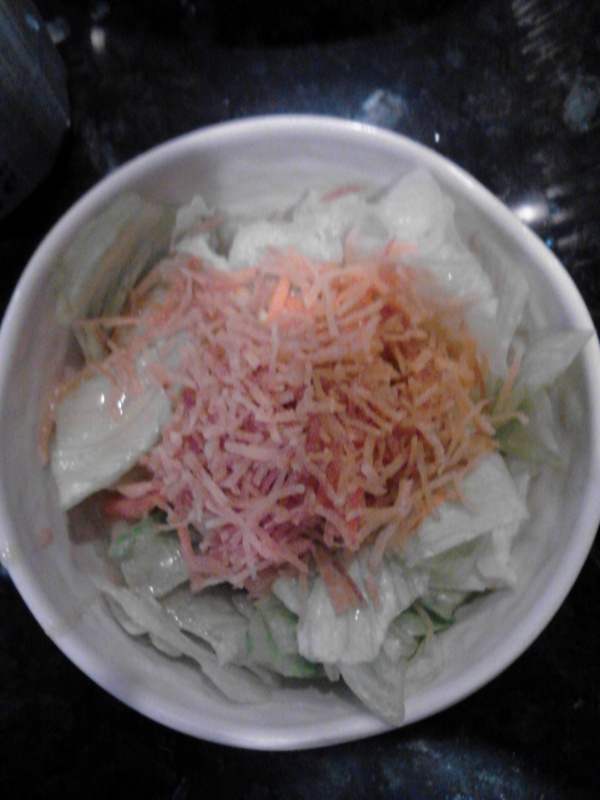 The salad came out first and was nicely done it had egg, onion, cheese, carrots, cucumbers, and a cherry tomato. A beard stick also came with the salad. The bread was not my favorite, it tasted kind of like a doughnut. 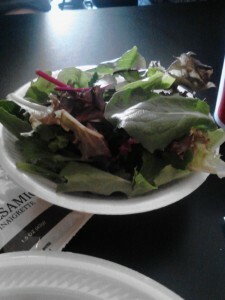 The salad however was great! 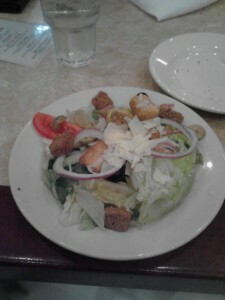 The lettuce was crisp and the toppings were fresh, even though the dressing was just ranch it was also good. I actually finished the whole thing. One the menu it says that the prime rib will be a 7 oz piece, but when we got it the prime rib probably weighed more like 12-13 oz. The prime rib was good, I ordered mine medium rare and it was close to spot on, there wasn’t much seasoning on it which was a little disappointing. The garlic mashed potatoes were very tasty, the garlic was there but not over powering. The vegetables were ok, I expected them to be a little more seasoned and not so buttery. The plate presentation for the prime rib and garlic mashed potatoes was not anything special. It was like any other prime rib plate; piece of meat on one side and potatoes on the other. The vegetables were in a separate dish and again in was nothing special. 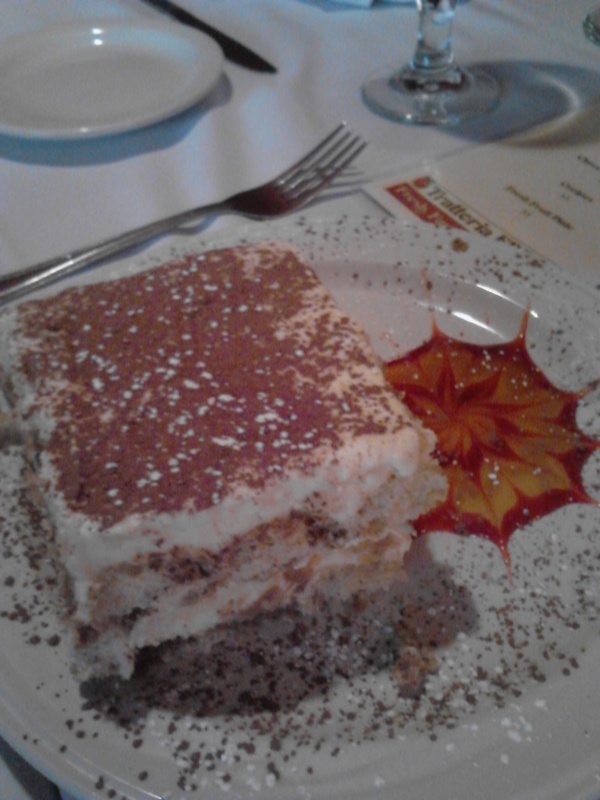 For dessert I ordered the tiramisu. When it came out I thought that the size was average, which was a good thing after the main course. The sauce that was over the top was good and helped to keep the different layers together. The plate presentation of the dessert was beautiful. 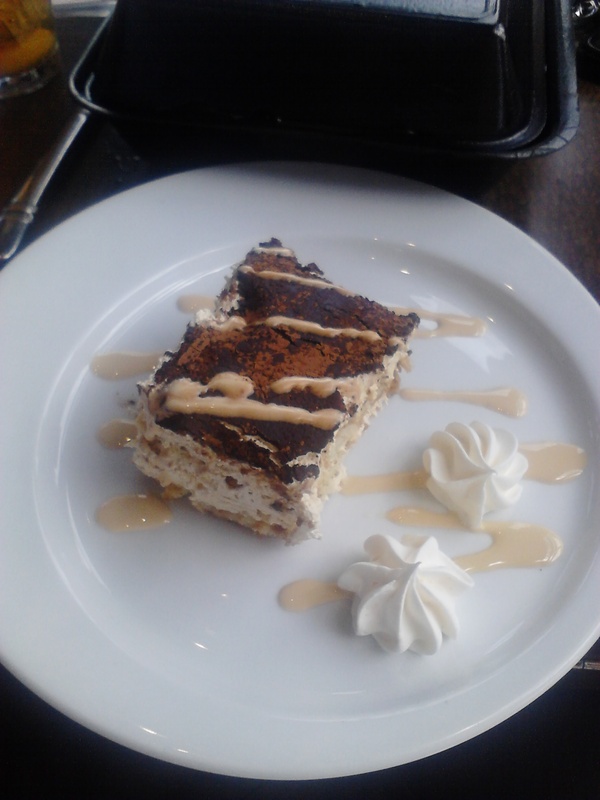 The piece of tiramisu was placed in the center with a cream sauce drizzled over the top of the tiramisu and the plate and then two dollops of wiped cream on the side. I will definitely be going back to Bev’s. The view was amazing and so was the food. This is a great date night place. Today we went back to 4th Street to Buffalo Alice and had their lunch buffet. Again if you do not want to pay for parking I suggest parking in the lot across from the movie theater and then just walk, it is no more than half a blocks walk. When I first got there some of the group was already there so I just joined them. A few minutes later we found out that we were sitting on the wrong side of the bar, oops. So we moved and then started to go through the buffet. 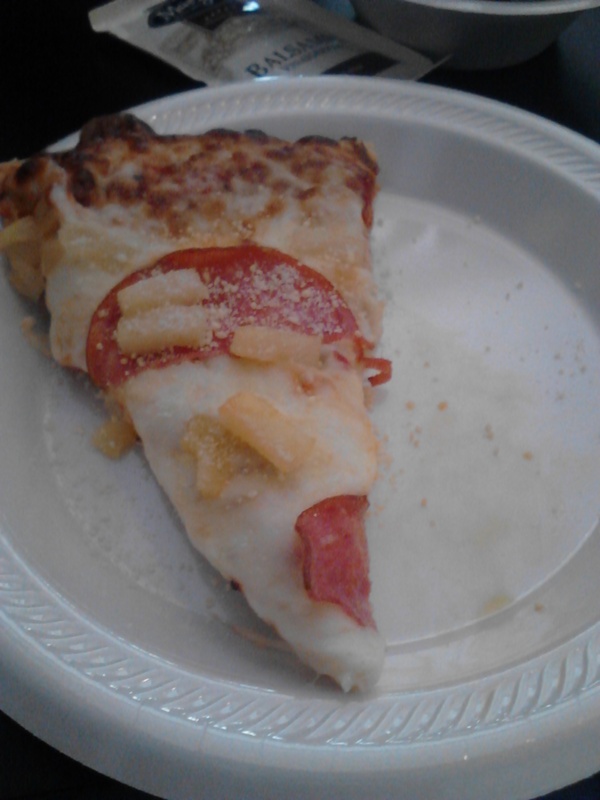 There were four different types of pizza to choose from: combination, pepperoni, Hawaiian, and sausage. 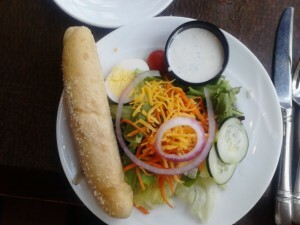 There was also a salad option and many different dressings to choose from. And there were brownies for dessert. Drinks were also self serve, if you wanted pop. If you wanted a beer there was a bartender ready to get whatever kind of beer your heart desired. The pizza presentation was ok, the slices were not the same size all around and maybe they meant it to be that way, but I’m not sure. The salad was in a sliver tube, instead of a salad bowl and it was not on ice. The dressings were all arranged on the table, next to the salad, separated by kind. The dessert was in a covered cake carrier, which is totally fine but it was hard to tell if we were supposed to look inside or not. I choose to try the pepperoni and Hawaiian pizza, a salad with balsamic vinaigrette dressing, a brownie, and a Cherry Coke. The pizza was very tasty, but it could have had more toppings and less cheese. The sauce amount was the perfect amount not too much to where someone is going to end up wearing it but not so little that you cannot tell it is there. The salad was fresh and I liked that they choose to go with something other than iceberg lettuce but instead went with a spring mix. I enjoyed the crispness of the lettuce and with the balsamic vinaigrette and a little grated parmesane cheese. 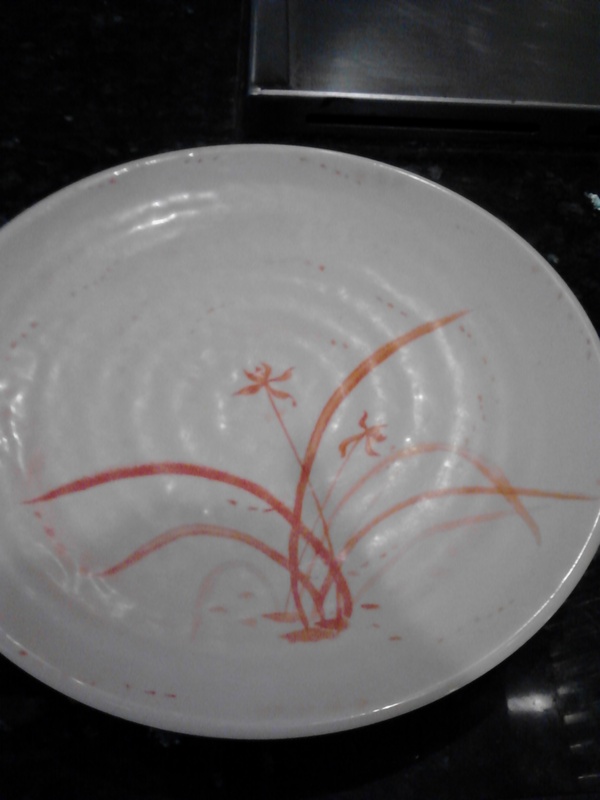 So there is really nothing to say about plate presentation since I did it myself. And as you can see I did not try to make my plate look like anything special. I would go back to Buffalo Alice, the pizza is good and from what I saw so was the beer. So if you are looking for a beer and pizza night this would be the place to hit up. Lunch seemed to get busy around 11:30 AM so to beat that rush I would say to get there about 11 AM, if possible, that way you can get your food, sit down, eat, and get out on your way. The buffet is $8.00 and is all you can eat, and comes with a drink (beer not included). So like I said it is a beer and pizza kind of place. This entry was posted in Uncategorized on May 24, 2013 by Daltynn. I love Italian food! So when we came to Trattoria Fresco today I was very excited. This was my first time down here and I have been on Jackson St hundreds of times and had never seen Trattoria Fresco before, so if you are looking for it it is easier to find. For parking if you do not want to pay, I would suggest parking down by the Promenade Movie Theater. 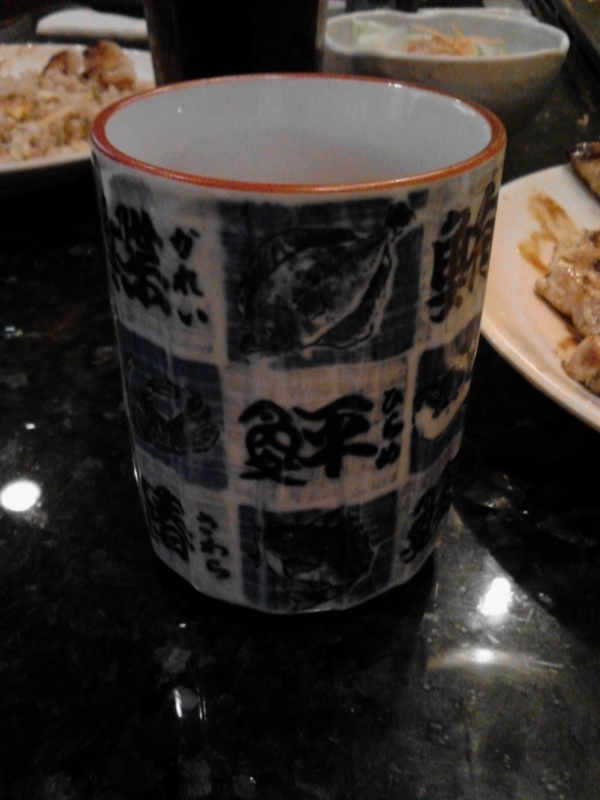 Upon arriving the waiter pointed me in the direction of where the group was sitting. When I got to the table I noticed that the places were already set with a water glass, two forks and a knife, and a linen napkin. The waiter came and asked for drink orders, to which I said that water would be just fine. Bread and butter was brought to the table for us to eat as we looked over the menus and also while we waited for our food. 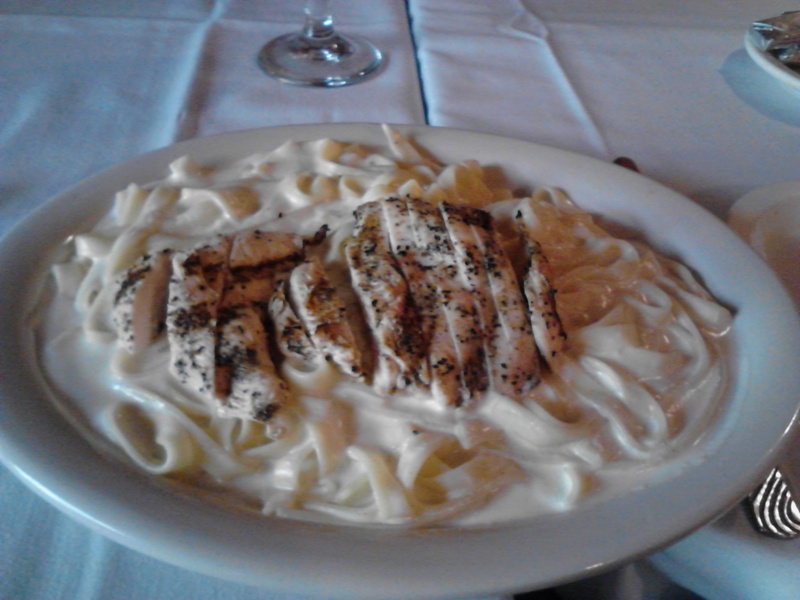 For lunch I decided to go with the Fettuccine Alfredo, which if you want meat to go with it you have to tell the waiter, with chicken. When it came out it looked like any other fettuccine alfredo with chicken that I have ever seen. 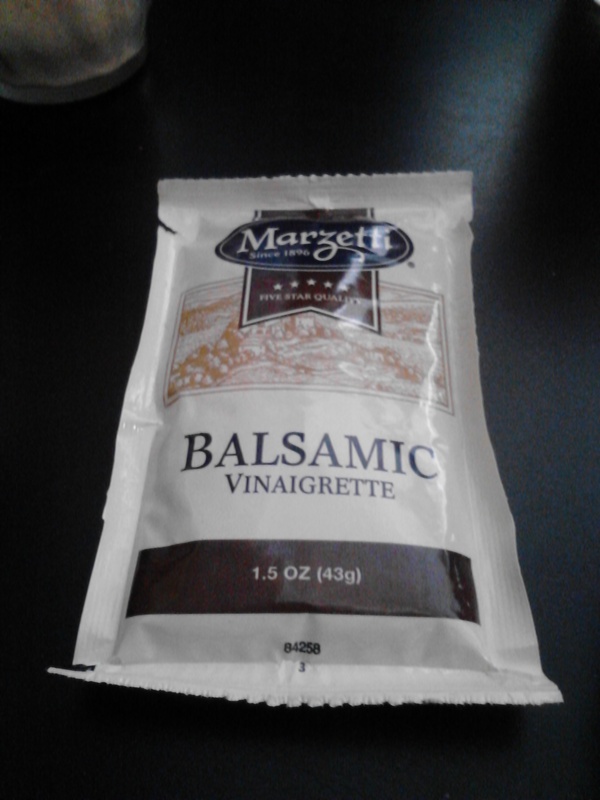 The alfredo sauce tasted really good but there was nothing special about it. The chicken was really, really good. 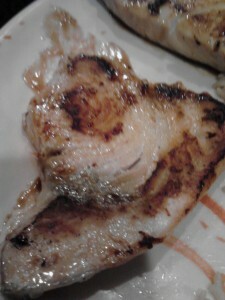 It was seasoned awesomely and was grilled just the right amount and it was moist. The presentation was nothing special either. It was a sliced chicken breast on top of noodles. 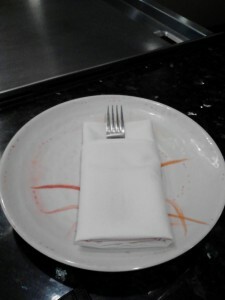 A plus was that the sides of the plate were nicely wiped off and clean. I have to say that the deserts were much more impressive! Most of us were pretty full after our main courses so we decided to order three and everyone just spilt them. And holy crap they were all so good. Like words cannot describe, sorry. Just look at the pictures and try to imagine. All three had incredible plate presentations. The syrups on the sided where so cute that I did not want to ruin them by eating it, but we did and it tasted as good as it looks. All were also powered with powered sugar and a chocolate powder. They were all beautiful and I wish I had more pictures to show everyone. 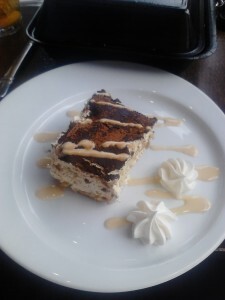 So on to taste of the deserts, if I had to choose a favorite it would be the Tiramisu it tasted so good, before when I have had Tiramisu the Kahlua was much to empowering and with this one it was not. Do not get me wrong you could taste it but it was just the right amount.The Chocolate Genoise would come in at number two. I love chocolate and after two bites of this I reached my fix for the day. This one paired the best with the sauce on the side I would say. Lastly, the Handmade Cannoli was just a little too sweet for me and my tastes. Trattoria Fresco is a place that I would go back to. It seems like the perfect place to have a nice date before or after a movie. I think that if you do head down there to save room for desert, no matter the costs. The owner says that Friday and Saturday nights are their busiest times so to avoid a rush maybe an early dinner those nights would be better. 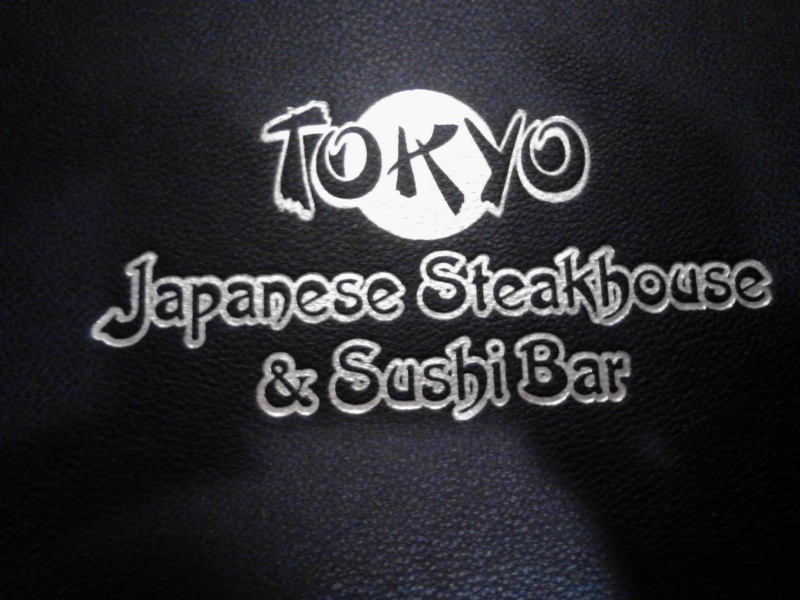 I have never been to a Japanese Steakhouse before so I had no idea what to expect from the experience, but as soon as we were sat at our table I knew I was going to have an interesting experience. We were sat at a black marble table that surrounds a flat top grill. The menus were very classy and professional. The first thing that I noticed when I sat down was the nicely set places. The plate was already at the table with a folded linen in a pocket fold style and a fork placed in the pocket. 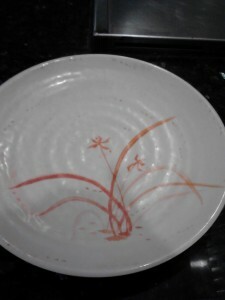 The plate itself was also very nice, the decoration on it was gorgeous. The waiter was very polite and took our drink orders. 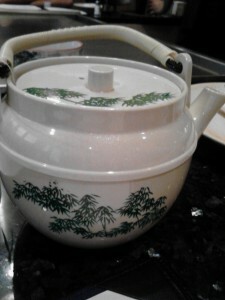 I ordered the Green Tea or Japanese Hot Tea, it came in a tea pot with a cup (see picture below). 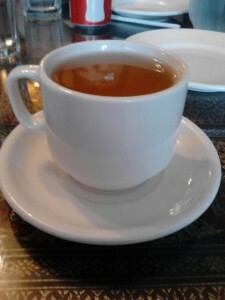 The tea tasted very good, especially since I had a sore throat. For lunch I choose the Lunch Combination, which allows you to pick two entrees from a list provided. It comes with a side salad, fried rice, and vegetables. I decided for my two choices to go with the swordfish and the Mahi Mahi. Here is a link to there menu http://tokyosiouxcity.com/attachments/File/mymenufinal.pdf. First came the salad. I enjoyed it, the ginger dressing was different but not in a bad way. The lettuce was very crunchy and fresh. The salad was quite like any other salad you would receive: lettuce, dressing, and some crunchy stuff. I would have expected the salad to have a little more to it, but once I saw how large the main course was I believe that small and simple was the perfect choice. 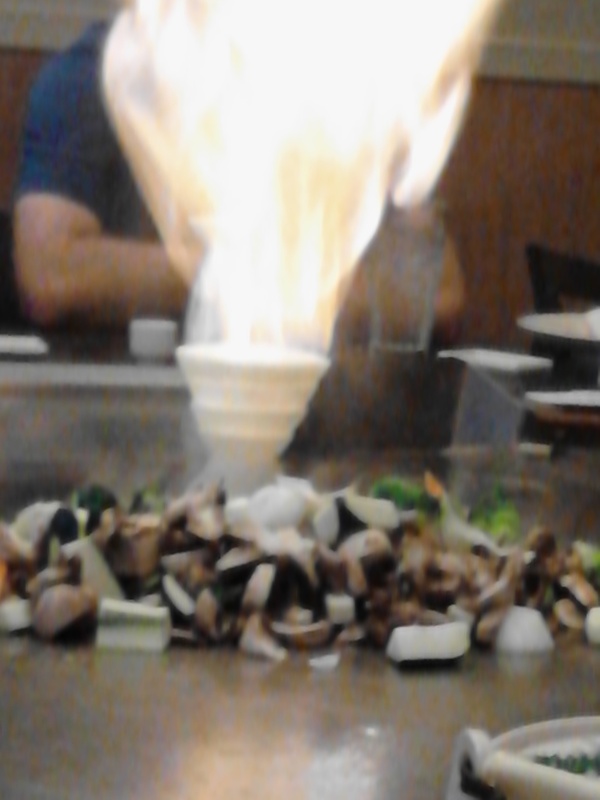 Next the chef came out and did a few tricks, which I am told are very similar to other restaurants of this nature. He started to fry up a couple eggs and rice to make a fried rice mixture. 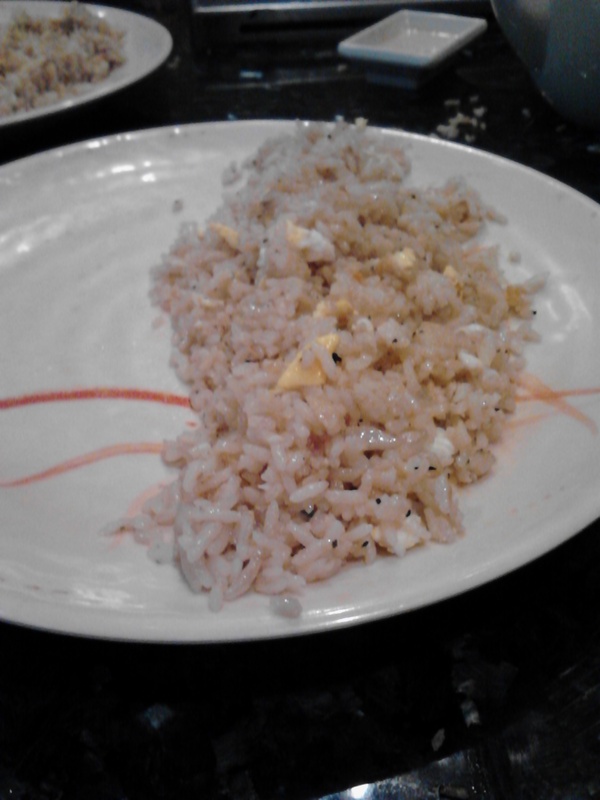 When the fried rice was finished he placed on the plate on the right side of everyone’s plate. Next he started placing the vegetables on the grill. While the vegetables were on the grill he did a fire trick with the onion rings (see picture below). After the trick was finished the chef placed the meats the everyone had chosen. As the meats got done the chef placed them on the left side of the plate. When all the meats were on peoples’ plates he then placed the vegetables down the center. The vegetables were very tasty and had a good seasoning with them. 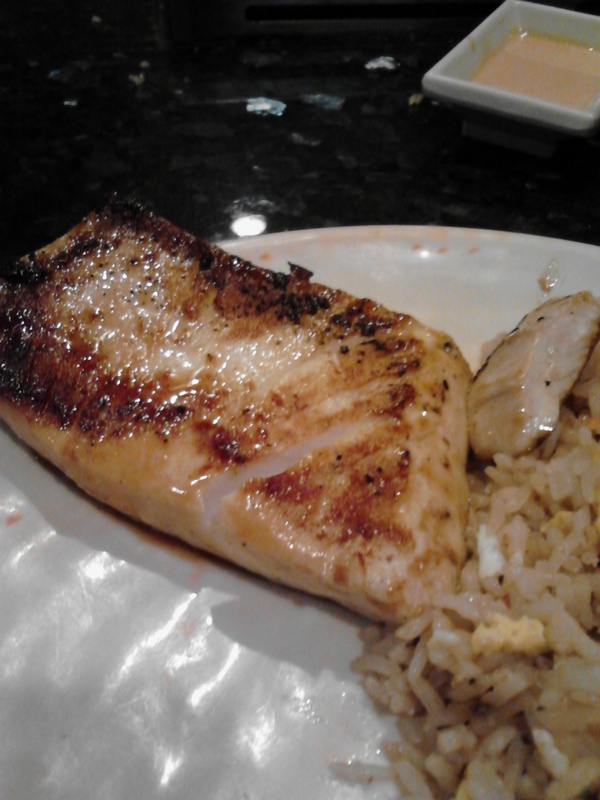 The Mahi Mahi was probably my favorite thing on the plate, I love fish and loved how the fish just fell apart perfectly as I ate it. The swordfish was good but I do not know if I would order it again, but I really enjoy the idea that I can now say that I have tried swordfish. And as always the rice tasted very good, I have to say fresh fried rice is so much better than predone fried rice. 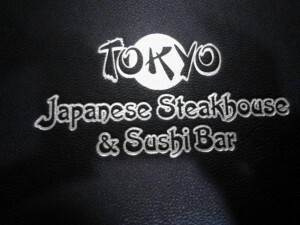 I would definitely go back to Tokyo Japanese Steakhouse and Sushi. I had an amazingly fun time and really enjoyed the food and the atmosphere. For how much food I got $14 was really not a big deal. So if you are looking to be entertained while eating this is an excellant option to look into. This was not my first time going to Rebo’s I had been there a couple of times before. As always the wait staff was very polite and professional. The tables that were set aside for us were pretty small and there was not much room to move once everyone had sat down. But the same amount of space really was not their fault, they fill up fast for lunch and there was also another group as well. The waitress came up and asked us for our drink orders and I of course got the iced tea. After the drinks were to us the waitress answered any questions that people had and took the appetizer orders. For a group as large as ours I was happily surprised that the appetizers came quickly. The waitress took our orders and got us refills on our drinks. For lunch I decided to try something other than a sandwich this time around so I went with the Rebo’s Chimichanga ($9.95). It was quite large and had good flavor. 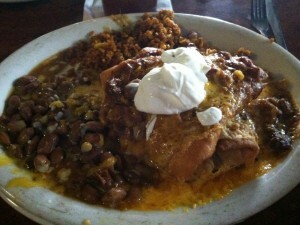 It came with Mexican fried rice and refried beans, both tasted very good and paired with the chimichanga very well. The plate presentation was a little sloppy to say the least. I’m not sure if they wanted it to look that way or not but it’s not always about the looks. 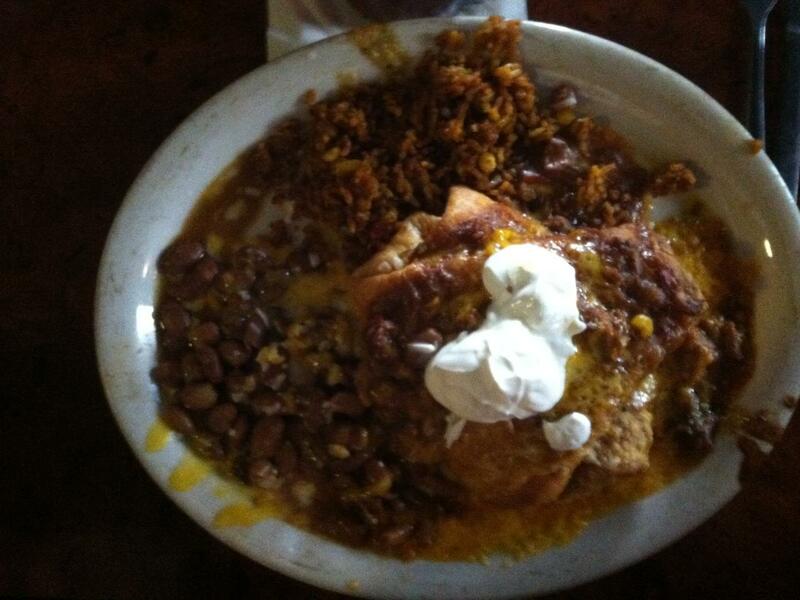 The chimichanga was placed in 1/3 of the plate, the beans had a third of the plate, and the rice had the last third taken up. Everything being smothered in cheese did not help the plate look any better, if anything it just made it more messy looking. The sour cream on top of the chimichanga could have been done better, it looked as if they had just thrown it on there without a care. Even though the plate did not look that pretty the tasted wonderful. The beans were very tasty. I do not usually like rice but I did like their’s very much, the seasoning made it more enjoyable. And even though cheese was every where it made it much much better. The chimichanga was fried excellently and the pork tasted very good. For desert I ordered the Seven Layer Cheesecake. 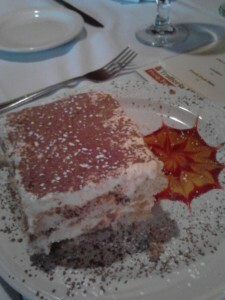 I cannot tell you what the seven layers where but I can tell you that it was amazing! It is served cold and some people seemed to be having a tough time getting their forks through it. 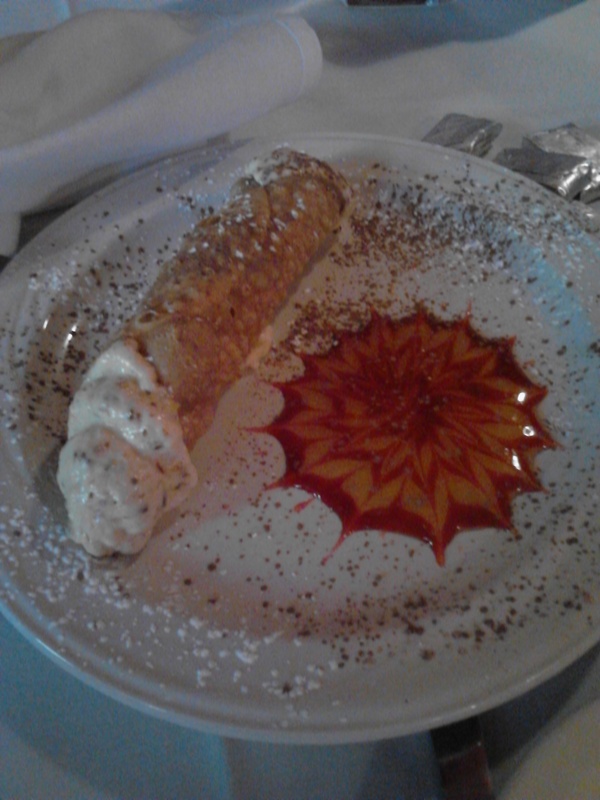 The desert is probably my favorite thing at Rebo’s. The plate looked very nice. The piece of cheesecake was on top of a carmel sauce and chocolate sauce, powdered sugar, and whole almonds. I love going to Rebo’s and I know that I will go back. 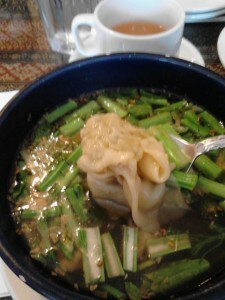 The atmosphere is great and the food is reasonably priced for what you get. 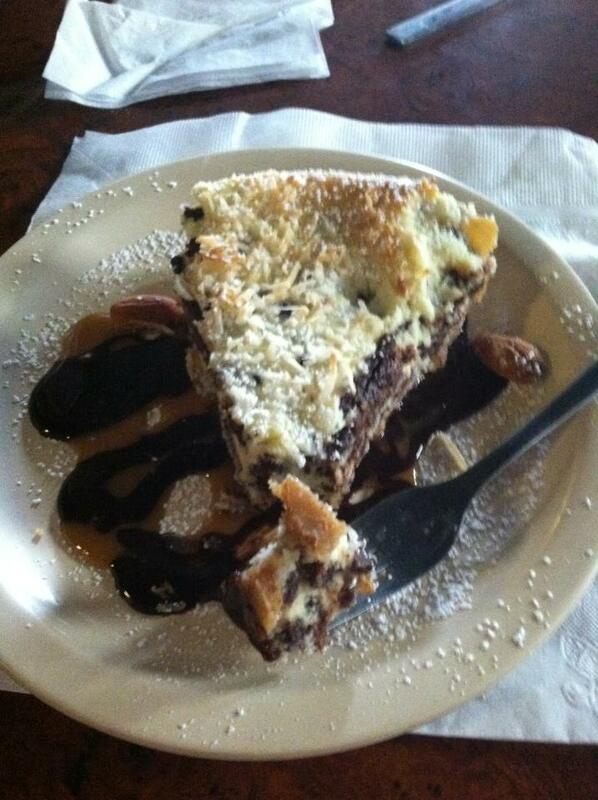 So I would say to come hungry otherwise you will not be able to finish your meal, let alone get desert. So I would say that if you are in Sioux City Rebo’s is a place that you must stop at while you are here. This entry was posted in Uncategorized on May 22, 2013 by Daltynn. Today the class again went downtown, we checked out two local hotdog restaurants. I had been to Milwaukee’s before but I had never heard of Coney Island. Milwaukee’s is located across the street from the Tyson Event Center on Pearl Street; Coney Island was a little more difficult to find which is located on Nebraska Street. I would say that an important feature of Milwaukee’s is that they have their own parking space whereas Coney Island only has on street parking. So we first went to Milwaukee Weiner House. Which if you have never been there before than here is a quick over view of how to go about getting your food: you walk in the door, wait in line, order you hotdog or hamburger, decide on a drink and chips, pay, and then go sit down and enjoy your meal. If you want to make sure you get a place to sit I would recommend getting there about 11 a.m. or before to beat the lunch rush. At Coney Island I ordered one Coney Dog (has cheese wrapped around it) with mustard and chili and a glass of water. I honestly had no idea what a Coney Dog was but I thought it sounded really good. The man was very nice when I told him I had never been there before and told me what the different toppings were. The service was not as fast here but there were also only two people working at Coney and probably did not expect 20 people to wonder in on a Thursday afternoon. The sizes of the hotdogs were very similar (again I forgot a picture, sorry). I did not find their chili to be as flavorful as Milwaukee’s and I am not fond of a slice of cheese being wrapped around the hotdog. This does not mean that I did not enjoy the hotdog; I mean I forgot to take a picture. For this post I will not spend as much time on plate presentation because there really is not much to report on. Both businesses work quickly and put the food on the plate to get the food to the customer as quickly as possible. This is completely fine, not many people say they go to a hotdog restaurant to enjoy the way that the food looks excellently placed on the plate. No, you go there to get your food and get out for a easy, fast lunch. So to give some credit the hotdogs at both places were placed in the middle of the plate and mostly all the plates looked the same, depending on how many hotdogs people ordered. My final would be to say that Milwaukee’s won in my book. This could be because I have been there quite a few times and just love the atmosphere. But on a more food level I like their cheese and chili very much and i will of course go back. This is not to say that I will not go back to Coney Island but I like that I can find Milwaukee’s a lot easier than Coney. *Fun fact- There is a candy store next door to Coney Island named Sarah’s Candies, the peanut clusters are awesome. Check it out! This entry was posted in Uncategorized on May 16, 2013 by Daltynn. Today I ventured with the class to Red Bone’s Cafe in downtown Sioux City. It was a little hard to find but if you stay on West 7th you’re sure to see the sign on top of the building, which is legible from about a block away. There is little off street parking and I am not even sure that I parked in their parking lot, oops. The waitress greeted me right as I walked in the door saying, “Welcome to Red Bones.” She pointed to where the rest of the class was sitting and then asked me what I would like to drink. 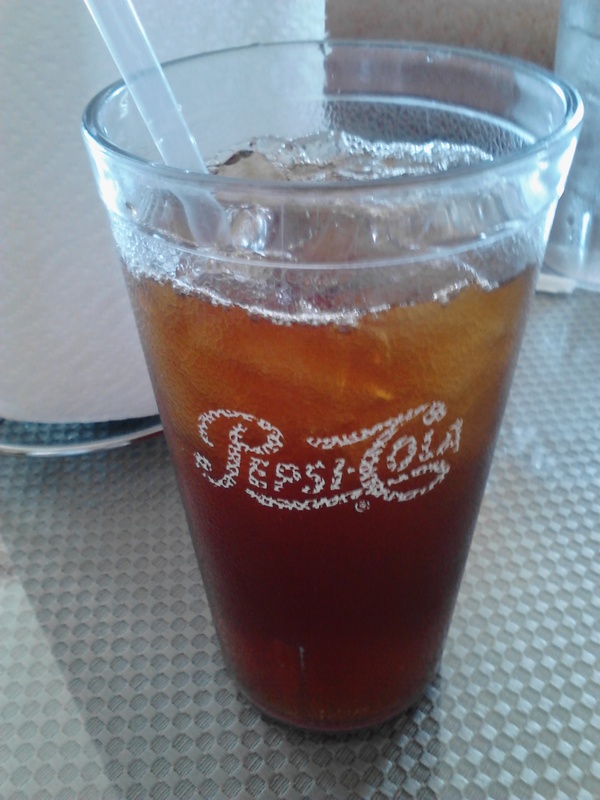 Of course being at a southern restaurant I ordered sweet tea. It was pretty amazing to say the least, I don’t know if they make it themselves or not, but it did not matter it was that good. When ordering our food we were not told about the special, which was a little disappointing. But I was pleased with the options on the menu: fried chicken, fried catfish, fried pork chops, and many sides to choose from. 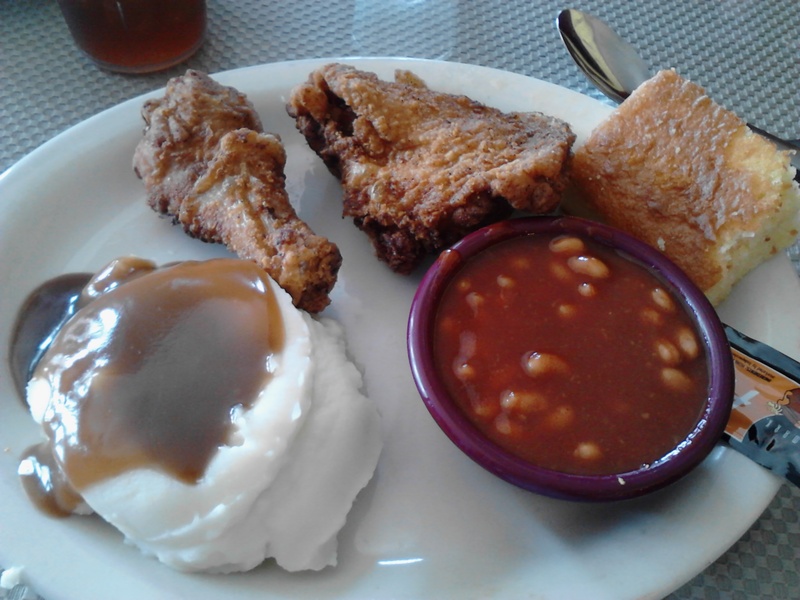 I ordered the Southern Fried Chicken Plate with a corn muffin and two sides, I decided on the Creamy Mashed Potatoes with Gravy and the Smoked Baked Beans for my two sides. Everything tasted good, the chicken was excellant and very moist, the mashed potatoes were tasty but if not for the gravy they would have been pretty bland, the baked beans were the best part with the seasonings used they were as close to perfection as you could get them, and the corn muffin was also very appetizing, I usually eat corn muffins with syrup but this one needed none of that. The plate presentation was very nicely done. You could definitely tell that the chicken was the main part of the meal because it took up the majority of the plate, then the two sides were the next largest, and the corn muffin took up the smallest amount of room. The food kept to the inner circle of the plate, except for the muffin which is expected. The beans stayed in their separate bowl well and there was no spillage of any bean juice onto the plate. The hole in the mashed potatoes could have been a little bigger so more of the gravy would have stayed with them instead of around the plate. Overall the plate was done pleasantly and from what I saw others with the chicken or catfish plates looked quite the same. 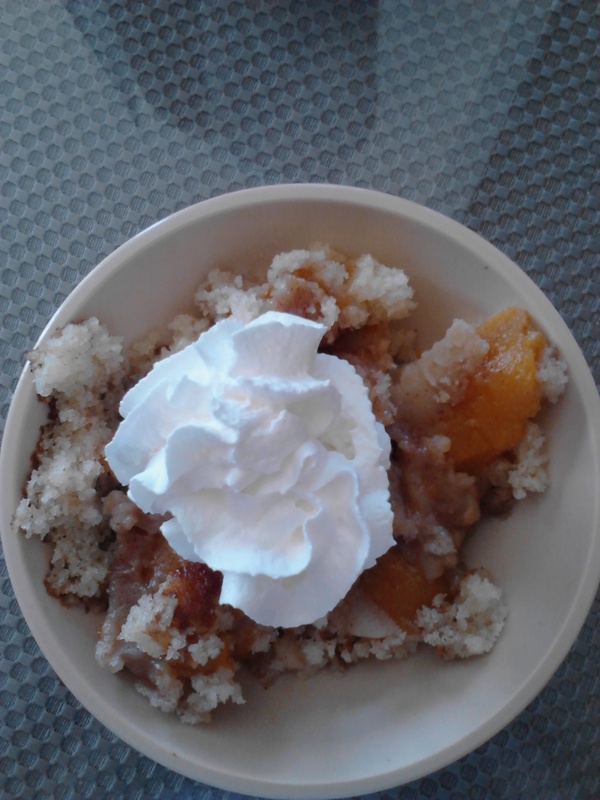 For desert there are two options: peach cobbler or sweet potato pie. 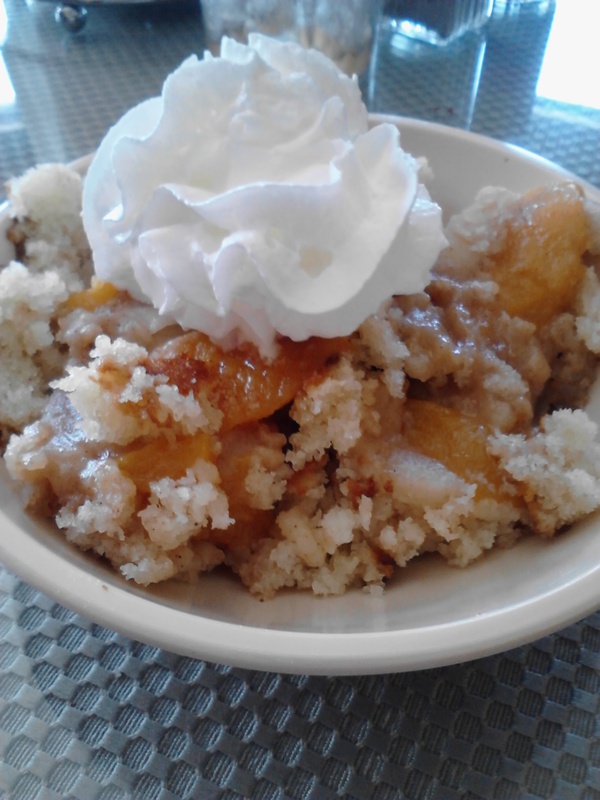 I decided on the peach cobbler and was happy with what I got except for the fact that there was no way I was going to finish by myself, luckily I have friends willing to help with that kind of problem. I wish there had been more peaches though. The whipped cream was a nice touch on top and I enjoyed that it was served hot. 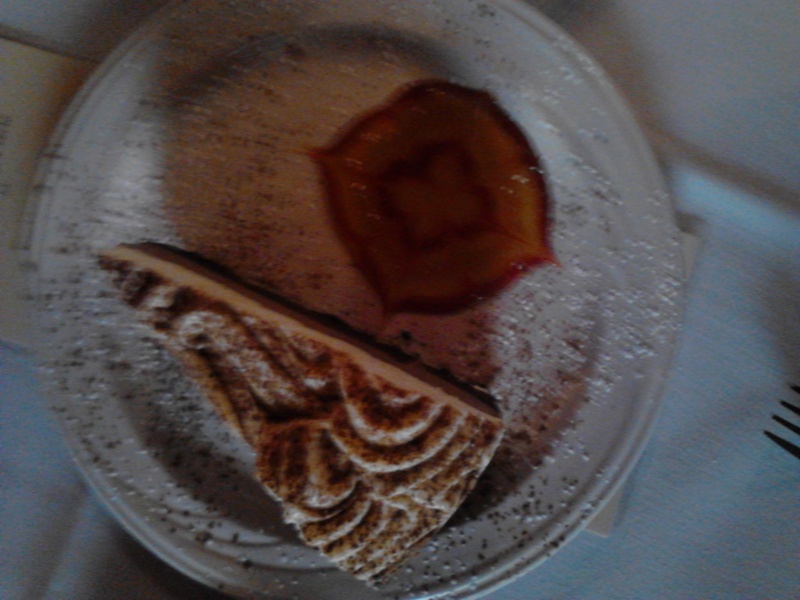 The dessert presentation was much like any fruit cobbler or crisp would be servered. It was in a dish that curved up on the sides just enough to hold in the continents and yet not look like a bowl. The cobbler filled the bottom of the dish and then on top was a dollop of whipped cream. This is highly normal and it works very well, my only suggestion would be to add some type on garnish to give it that extra step, this could be as simple as a mint leaf placed in the whipped cream. Overall, if you like good fried chicken and sweet tea you’ll love this place. 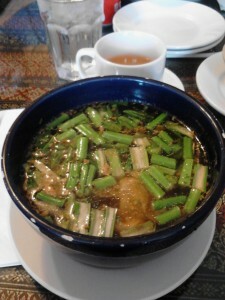 The portions are wonderful and the atmosphere makes you feel very comfortable, even with a news station filming. The wait staff are very helpful and kind to new comers that may not know what they are getting themselves into. So everyone this is a place to put on your list of must stop ats. *Fun Fact- Today I learned that Leonardo DiCaprio has been in several good movies according to my table mates. You learn something new everyday! This entry was posted in Uncategorized on May 15, 2013 by Daltynn.